It is quite rare that watersheds have boundaries that correspond to the administrative limits. Nam Ton Watershed is actually included in two provinces: Vientiane Capital and Vientiane Province. In each of the province, there is one district that includes the Nam Ton Watershed : The upper part of the watershed is located in Hin Heub District (Vientiane Province) and the Lower Part is located in Sang Thong District (Vientiane Capital). The Districts play a key role in terms of local development and socio-economic planning. 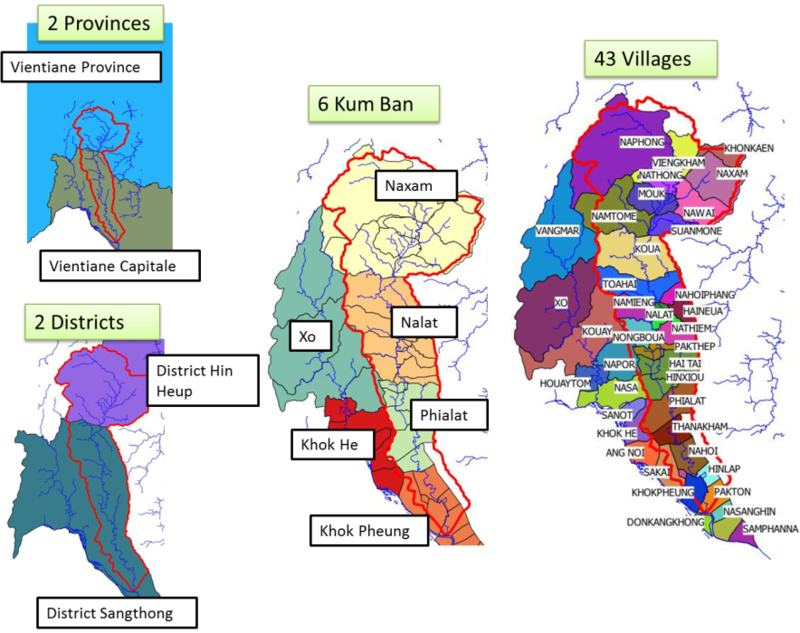 The Districts are divided into Village Clusters namely “Kum Ban”. There are 6 Kum Ban in NTPA but actually mainly 4 are located in the Nam Ton Watershed : Naxam, Nalat, Phialat and Khok Pheung. The two others Kum Ban are part of the nearby watershed. Naxam is located in Hin Heub District whereas the other Kum Ban are located in Sang Thong District. Each Kum Ban include several villages as shown hereunder, the total number of villages in NTPA is 43. The Villages and Kum Ban levels will be widely addressed in this document as one of the main activity of SUMALOM Nam Ton Project is the development of a systematic Participatory Water and Land Use Planning process, which is a key milestone to develop of a Community-based planning process that would complement and reinforce the existing planning mechanisms applied at District, Province and National level in Lao PDR.